Lynx Peak is a stunning mountain in the southern Talkeetna Mountains, which sit between the Chugach Range to the south, and the Alaska Range to the northwest. The Talkeetna Mountains are sort of the forgotten mountain range in Alaska, with few people venturing into these remote valleys and peaks. Only locals to the Mat-Su valley or Anchorage would normally roam into this beautiful area, which can only be accessed by one road. The Hatcher Pass Public Use Area is the only area in this vast land accessible by car, and with the abundance of granite walls in the vicinity, it has become popular for local rock climbers to want to spend the little time in summer to climb the moss covered and damp routes. Lynx Peak itself sits above the Reed Lakes, which is a popular hike with a nice trail leading to two alpine lakes in a large basin with high peaks towering above on all sides. Hiking to the lakes takes just a few hours at most, but the scramble to the top of Lynx Peak involves another few hours of cross country travel up talus or snow slopes, traversing the top of a large glacier and/or an extensive exposed ridge scramble. It offers a spectacular day climb or easy overnight trip with great camping at either lake. From Anchorage, drive north on the Parks Highway (Number 1) to the town of Palmer and continue through town and turn left (west) onto North Palmer-Fishhook Road. Stay on this road as it enters the Little Sustina River Valley and turns into the Hatcher Pass Road. It winds its way up along the river, and gains treeline around 1,700 feet just before a U-turn bend at some old cabin-like small buildings on the right. The little spur off to the right at the switchback is a parking area for the 8 mile long Gold Mint trail that continues northeast up the Little Sustina River, and eventually reaching the Mint Glacier and the nearby MCA hut. For Lynx Peak however, you will continue through the switchback and go another 3/4 mile and turn sharply right on the Archangel Road. This well graded dirt road goes for a couple miles to a nice bridge crossing Archangel Creek, then the road quality decreases substantially into a maze of big potholes. The Reed Lakes trailhead is just 100 feet or so past the bridge on the right. For low clearance cars, it's advised to just park by the bridge. Take the Reed Lakes Trail to Upper Reed Lake, which takes 2-3 hours for the average hiker. It can be done faster though, and walk around the left (north side of the upper lake. The trail more or less disappears once you pass the upper lake, but staying 200-300 feet above the lake as you head around provides less talus sidehill traversing on the steeper slopes right near the lakeshore. You will need to reach the small 5,500 foot saddle known as Bomber Pass, where you have two options for finishing the scramble up Lynx Peak. They are described below. This is a more fun route to the summit, as it offers plenty of exposed scrambling on good granitic rock. The difficulty is never really tough but the rock is covered in thick moss making it slick in many spots. From Bomber Pass, begin scrambling right up the crest of the ridge, avoiding any serious difficulties by traversing a few feet below on mainly the left side of the ridge. There are many small tricky sections but should not exceed Class 3 but the exposure is high. You will begin to see a smooth ramp feature on the ridge as you approach the final ascent to the upper slopes near the summit. This ramp appears to angle up a very steep angle, but rest assured it is very manageable, and once you reach the base of it, it is actually a class 2+ scramble utilizing the cracks and ledges that cut the otherwise smooth ramp. Above this, the upper slopes, which are mostly talus lie ahead of you. It's 400 more feet to the summit from here, up loose rock so be careful if there are people below you. These upper slopes hold snow cover into July so take note, and bring an ice axe and maybe traction. This route is more just a variation from route 1 described above as it bypasses much of the scrambling on the northwest ridge direct. This would most likely be the easiest and the standard route up Lynx Peak. From the same 5,500 foot Bomber Pass, rather than scrambling the ridge crest, drop 100 feet down the north side of the pass onto the upper Bomber Glacier. Traverse moderate snow slopes below the ridge and angle back up to the small notch at the base of the ramp described above and meet up with the ridge again. This bypasses the harder scrambling on the ridgecrest, but may not be feasible in late season if the upper glacier is icy. This route would require an ice axe at any time of year and certainly crampons after July. The Bomber Glacier, which carves out the stunning northern cirque of Lynx Peak has more to offer than you may initially think. Many people every summer actually make the hike past Reed Lakes, and over Bomber Pass and never reach the summit of Lynx Peak because their destination is of a different variety. It's an old TB-29 fighter plane that crashed on the lower Bomber Glacier at about 5,700 feet, just below Lynx Peak. The crew on-board were performing a routine radar calibration training, but got off course in bad weather and crashed on November 15, 1957. Six of the ten crew members died, who were stationed in Anchorage. The hike to the remnants of the aircraft is popular, and often people include a full loop tour, heading around over to the Mint Glacier and returning down the long Little Sustina River trail for an all around alpine traverse encompassing 3 or 4 days. You can stay in MCA huts the whole way, the first being the Bomber Hut below the Bomber Glacier an hours hike down from the crash site, and the second being the Mint Hut at the base of the Mint Glacier near the head of the Little Sustina River Valley. The climb back up the Penny Royal Glacier, which is the glacier just east of the Bomber Glacier takes you over Backdoor Gap where you can descend the Mint Glacier to the Mint Hut well off to the west of Lynx Peak. May to September offers the best weather. Days become very short and you'd have to be willing to go through some serious cold from November to February. March-April would offer some great skiing opportunities and October would provide stunning early winter beauty while still being able to have enough daylight. 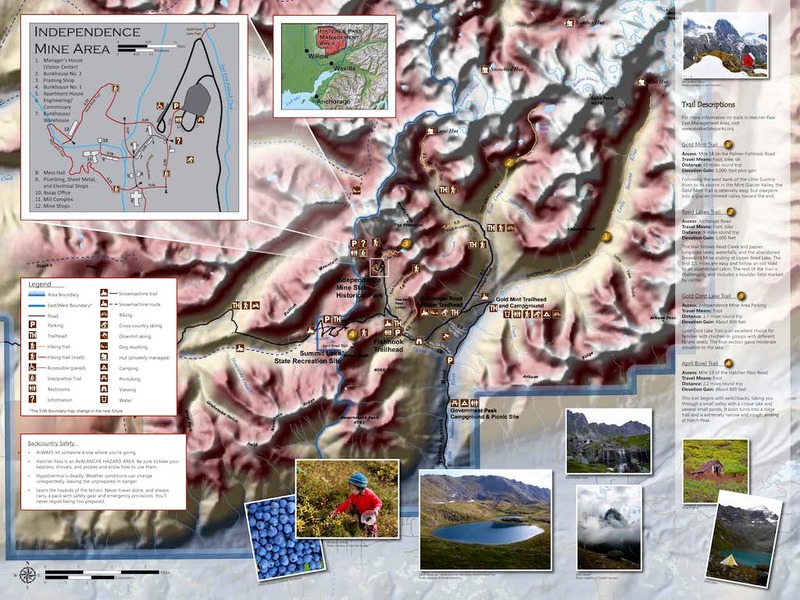 The Hatcher Pass area has virtually no red tape to speak of. Enjoy this pristine area and do your part to keep it clean.